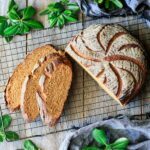 Keep up your clean eating habits with this easy recipe for healthy whole wheat molasses bread. It’s a rustic, crusty loaf that’s slightly sweet—perfect for toast at breakfast or for sandwiches at lunch. It also contains fiber and protein to keep you full. Warm the milk to 115 F in a small saucepan or in the microwave. If you warm the milk in the microwave, put a small wooden spoon or chopstick in the milk to break the surface tension and prevent it from exploding. Pour the two flours into the bowl of a stand mixer. Add the salt and yeast on opposite sides of the bowl and stir each one in with your finger or a spoon. Add the molasses and butter and mix on low speed with the paddle attachment until blended. Gradually trickle in the milk as the mixer runs, forming a sticky dough. You may not need all the milk, depending upon the humidity and the brands of flour you’re using. Switch the attachment to the dough hook and knead on medium-low speed until the dough is smooth, less sticky, and somewhat elastic. Test the dough with the windowpane test. Break off a lump of dough and stretch it between the thumb and forefinger of each hand. If the dough stretches until it’s translucent without breaking, it’s kneaded enough; if not, knead for a minute longer and check again. Shape the dough into a ball, cover tightly with plastic wrap, and set aside in a warm place to rise until doubled in size, about 1 1/2 to 2 hours. Turn out the dough onto a lightly floured surface and punch it down all over to knock out the gas pockets. Cover the loaf with the banneton’s linen cover or a tea towel and let it rise at room temperature until about doubled in size, roughly 1 1/2 hours. The dough should spring back when gently poked with a fingertip. About 10 minutes before the dough is done proving, preheat the oven to 425 F.
Gently turn the risen loaf onto a baking stone or ungreased cookie sheet. Don’t worry if the loaf deflates a little; it will rise back in the oven. Use a piece of thread to gently mark the loaf in quarters, then carefully score the loaf in the desired pattern with a baker’s lame or very sharp serrated knife. Immediately put the bread in the oven and bake at 425 F for 25 minutes, then lower the temperature to 400 F and bake for another 15 minutes. The loaf should be deeply browned and have an internal temperature of 190-200 F.
Let the loaf cool completely on a wire rack before slicing and serving.